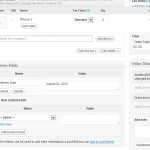 This plugin will allow the customer to choose an order delivery date on the checkout page. The delivery date will be visible to the site administrator on the orders page. From the plugin’s admin dashboard, you can set which days should be made available for delivery, in addition to setting a Minimum Delivery time and Number of dates to choose from. From v2.8, you can set holidays on the dates you do not deliver products under Holidays tab. The customer can choose any delivery date that is after the current date. The delivery date chosen by the customer will be visible to the site administrator on the Orders page. You can also set which days you want to be available for delivery from the Order Delivery Date menu from admin section of your site. The delivery date will be displayed on the My Account page’s View Order page. The delivery date will be added to the email notification received by the customer on placing the order. Also the delivery date is attached to the customer invoice too. 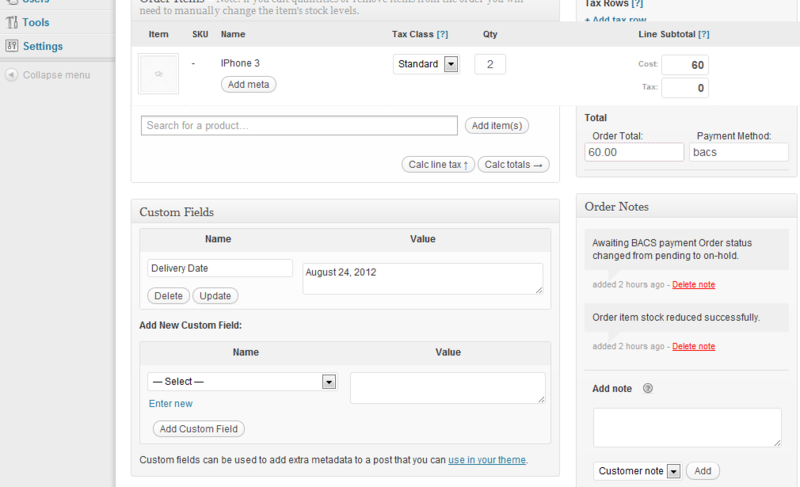 You just need to activate this plugin & get Order Delivery Date menu on your admin side panel. You can enable the days you want to be enabled for delivery. The delivery date field will appear on the checkout form. Deactivating the plugin will hide the field from the checkout form as well as from the admin order page. On deactivation of the plugin your settings will stay intact. Even this free lite version has a ton of options. And from my research, this is the only delivery date plugin for Woocommerce that has such a granular adjustment on the minimum delivery date. It can be set in hours, not just days like the rest of them. So for instance, I’m using this on the floral shop website and I set the minimum delivery date to 13 hours. That means that someone can order flowers for same-day delivery up to 11:00 AM. That’s a pretty important little feature…great job Tyche Softwares! Works well. A conflict between this plugin and another plugin I am using was resolved within a week in the next release. Simple, no fuss, does the job. Exclusion localization is unacceptable even for the free version! I need translate for portuguese and exclusion localization is unacceptable for the free version! Works, but needed to add custom js to make date picker input a readonly field. Very bad, it is not clear and it does not work. The perfect solution for handling time slots. Managing deliveries is now smooth. Custom cut off times for each day.We use this plugin for the web shop of our florist for customers to arrange deliveries Monday to Friday and on Saturday mornings. Being able to set an earlier cut off time for Saturdays (or Sundays when applicable) is great. Just what I needed and no fuss! Great plugin and great support.Thanks again for the great work, really appreciate it. Using order delivery date LITE. Fantastic plugin for woocommerce. 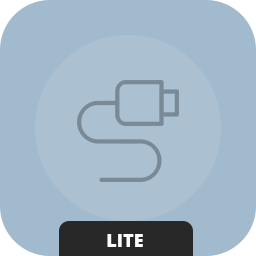 Even though LITE version is free, support is clean fast and magnificent. After my request for help they fixed my issue in no time and released an update of the plugin. Tremendous job guys, keep up the superb work! deltafrog — Works great. Is there a way to make it so only certain products have a delivery date field? Thanks! brandonecarr — This plugin is the perfect solution for allowing your customers to tell you when they’ll be available for delivery. Especially if you’re a small business that tends directly to your customer, this plugin will allow you to ensure their happiness with their order in that they’ll know exactly when to expect their delivery. A definite 5 star rating for the plugin and a 5 star rating for the support that it comes with! Please don’t have any doubts purchasing this one! Best money you’ll ever spend! creaselambert — A perfect plugin, says what it does and adds the functions simply with no fuss. I even had additional support when I wanted to tweak the plugin to fit my site better. Would recommend this to everyone. syazalina — I really love this plugin. It’s perfect! The developers also done a very good job! Love it! Awesome looking plugin/extension you have. Is it possible to add the requested “Delivery Date” to the WooCommerce Email Templates so the Shop Admin and Customer get the “Delivery Date” listed on their email confirmation? Ok – I see the feature is listed on the Pro plugin. That’s right. That feature is already present in the Pro version. Hi, I am trying out the lite version before buying the pro. I installed the plugin and got the delivery textbox appearing in my checkout page. When I clicked the text box, the date picker does not appear. I don’t any other plugins install, beside Woocommerce. Hi KC, It could be happening due to some conflict with your theme. Could you please email me with your site details & with the wordpress admin access so I can check this? How are you? I seem to be having the same problem. Was your issue resolved? Can you share the solution? 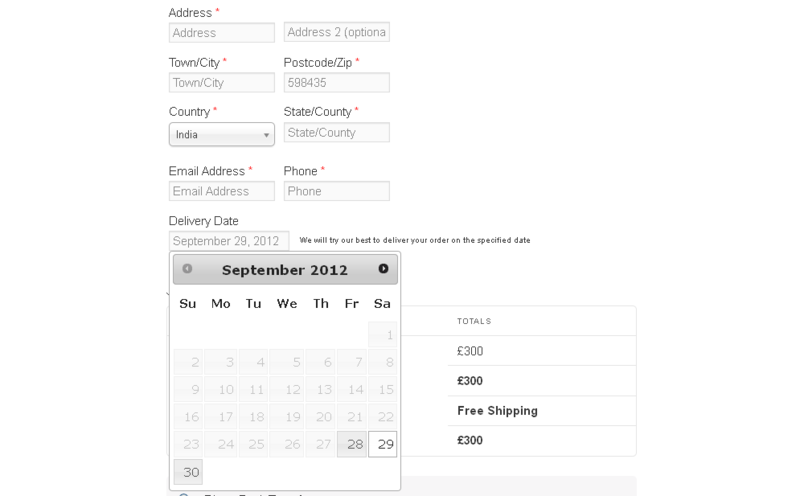 Hi, is there a way to have a specified date only, so user only have a limited choices of date for delivery. 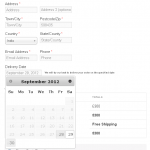 Like example 4-5 dates only for delivery date options. Yes, you have the option to enter specified dates of your choice in the PRO version. You can do so from the “Delivery Dates” tab in the “Order Delivery Date” settings in admin. I hope you got my reply Christian. Did that work? In the description above (Version 1.8 Lite) you say that the delivery date shouldappear in the customers email notification. This doesn’t work for me. Any suggestions why this could be? It should be appearing. Did you try by deactivating other plugins & by changing the theme to WordPress default theme? If not, can you try that? If that still doesn’t work, then you can create a request on the support forums & the team shall check it tomorrow.